BEAR 71, a collage-like online documentary by Leanne Allison and Jeremy Mendes that was released this year by the National Film Board of Canada, helps us see human-wildlife interaction from the animal's perspective. 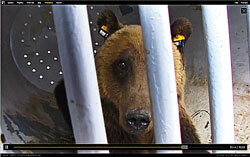 Voiced by actress Mia Kirshner, the namesake grizzly narrates her life as it is recorded by radio collar and cameras stationed around Alberta's Banff National Park. Viewers can track her movements and those of other tagged animals on an interactive map. If Bear 71 isn't enough to convince you of the perils of bear-human interactions, the arresting film Spoil will. Some of the world's top photographers and videographers documented British Columbia's Great Bear Rainforest, its elusive "spirit bear," and the Gitga'at First Nation's efforts to save both in light of the proposed Northern Gateway pipeline development. In Demon Fish: Travels Through the Hidden World of Sharks (Anchor Books, 2012), Washington Post environmental reporter Juliet Eilperin chronicles her travels among communities worldwide that regularly interact with sharks—from a secret fin market in Hong Kong to a worship ceremony in Papua New Guinea. Its message is similar to that of Bear 71: The biggest monsters are us. Journalist Susan Casey covers the evolution and survival of the Farallon Islands' great whites in The Devil's Teeth: A True Story of Obsession and Survival Among America's Great White Sharks (Holt Paperbacks, 2006). The National Geographic-funded lets the public upload photos of wildlife they've encountered so that researchers can study flora and fauna. Other noteworthy apps include iTrack Wildlife, which can help you track 65 North American mammals, and Wild Edibles, for celebrating our berry-foraging instincts. As Bear 71 notes, a platypus can sense electromagnetic waves, and a grizzly can smell an elk from 11 miles away. So how do other animals experience their environment? Eyewear company Mezzmer offers an infographic on the perceptive precision of eight animals. The PBS Nature series Can Animals Detect Disasters? shows how tapping animal senses can alert people to natural catastrophes.